So I’m in San Francisco. So I’m in San Francisco, staying with my dear friend whom you may remember from here and here. She’s my guide to all things beautiful and in fashion, hip but classic, and no sooner had I stepped through her door last Thursday than she asked me – Do you want to know what I’m eating for breakfast these days? Why yes, yes I did. Peering into the refrigerator of her cute Noe Valley flat, she explained her new overnight oats strategy she found in Into the Gloss. The prep is minimal, it’s an easy, fuss free option to drop into your purse before heading to work and it tastes amazing. The whole mixture is nutty and crunchy, a touch sweet and totally satisfying. And I certainly appreciate the fast prep, now that I’m back to chasing benjamins at a 9-to-5. Enjoy! KT sent me this recipe from Into the Gloss, but the recipe was developed by Lily Kunin who pens the NYC blog Clean Food Dirty City. Prep time: 5 minutes, plus overnight to soak oats and chia. Serves 2. 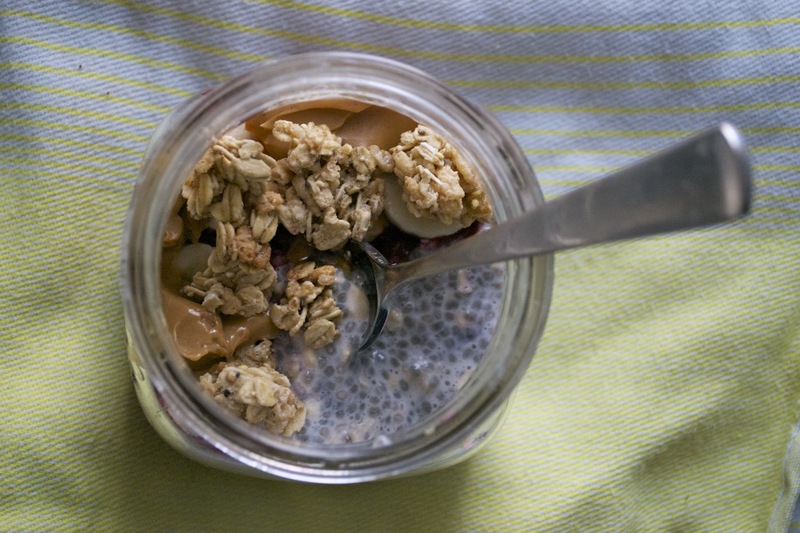 In a jar, combine the chia seeds, rolled oats, and unsweetened vanilla almond milk. Add a squeeze of honey or agave nectar to taste. Mix well and stick in the fridge to soak overnight. The mixture will thicken as the chia seeds expand. Combine raspberries, honey, and lemon in a jar. Use the back of a spoon to mash the mixture together until it creates a jam-like consistency. (If you are using frozen raspberries, run them under warm water to make them easier to mash). Stick in the fridge overnight. In the morning, mix the chia overnight oats to evenly combine. Use two glass jars and gradually add each layer to the jar. Begin with a layer of the chia oat mixture, top that with raspberry jam, and then layer of sliced banana. Add the remaining chia oat mixture and top with almond butter and a sprinkling granola for a little crunch factor. Alternately, arrange chia oat mixture with raspberry jam and toppings in a bowl. Enjoy!